I’m very lucky to have received two pawesome housewarming presents! 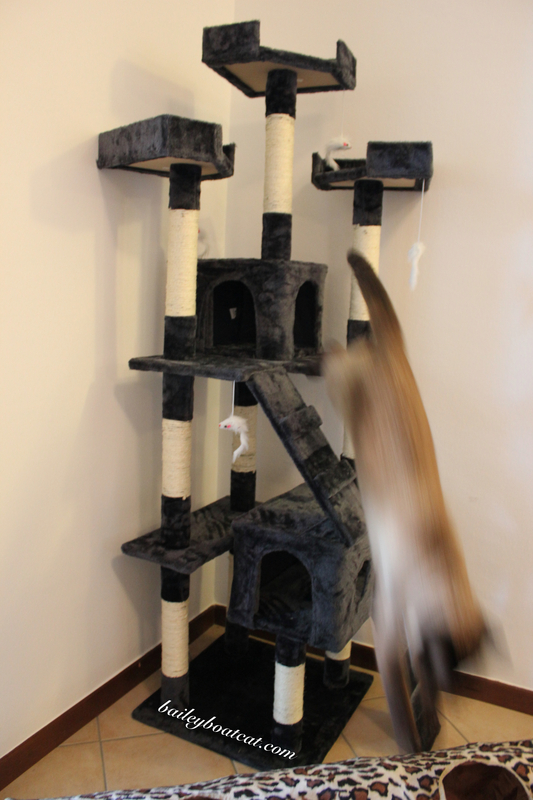 The humans ordered me a cat tree online and it arrived today! 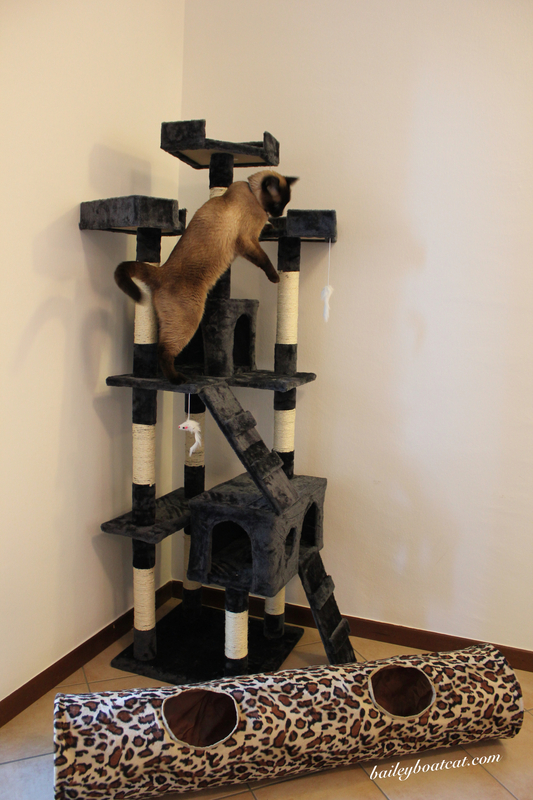 It’s tall enough for me to climb and look down on evfurryone! It’s great fun jumping on and off it! I’ve really missed climbing all over the boat and I’m happy that I’ll have a great perch to escape from my little sister when she comes. 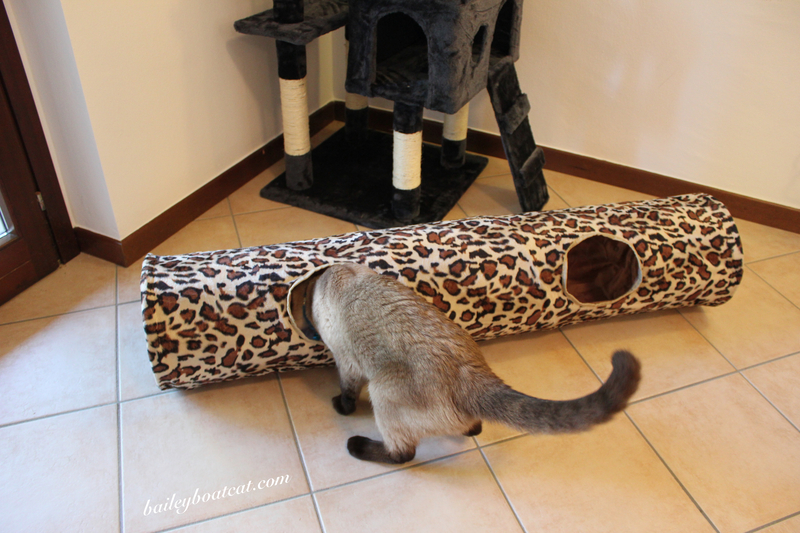 The Gramps also sent me a purrfect cat tunnel to play with and hide in. It’s over three times the size of my old tunnel! I love running through it and popping out when the humans least expect it. I love it thank you both very much! « Preventing history repeating itself! 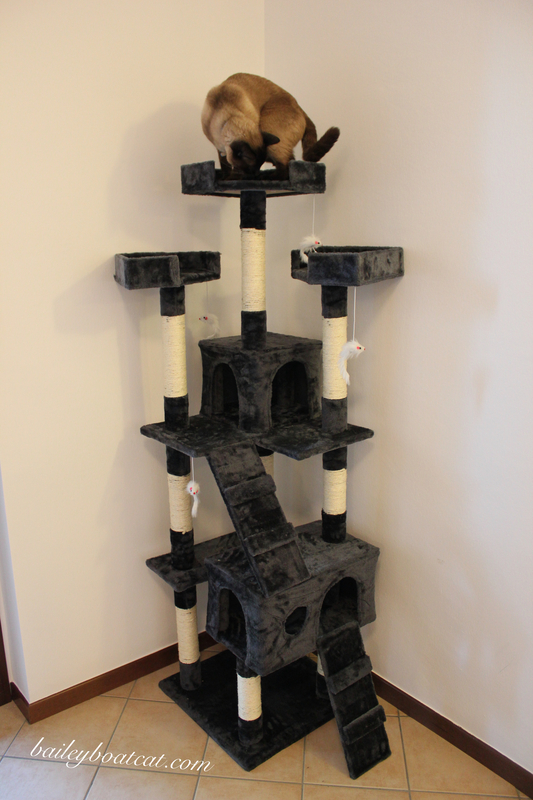 Wow Bailey what great presents I love your Cat Tree! I especially like the photo of you zooming down in a blur! Wow, those are great gifts! We have a tunnel at home, too and Ella loves it but it makes Lily very nervous. I’m going to have to think about a cat tree, but considering Ella and Lily both like to sit on top of the bookcases, I’m not sure if they need a tree, too. Bailey, we love your multi-level condo and your tunnel. You made out good. Bailey what wonderful gifts! That tree is just what I was thinking might keep you from clawing the sofa AND give you a good spot to get away from a “busy” puppy when she arrives. The tunnel is fun – you might even find that the pup wants to play in there with you…………….I’m happy for you. Enjoy yourself! OOoh brilliant! and we LOVe our cat tunnel here Bailey. Enjoy!! That cat tree is pawsome! And we have a tunnel just like that. We love it!! That’s totally pawsome, Bailey!!! Toby wants me to get him a passport so he can come over right away to play!!! We can’t wait to see you new sister!! WOW! That tree is pawsome! Bailey, those are very pawsome furnishings for your landlubber quarters!! My cats have the exact tree, just a different color. It is pretty threadbare, but still going strong! These are great gifts! That cat tree is amazing! I have a feeling you WILL need those when your sister comes. Now that is one big scratch pole!! You have done well! 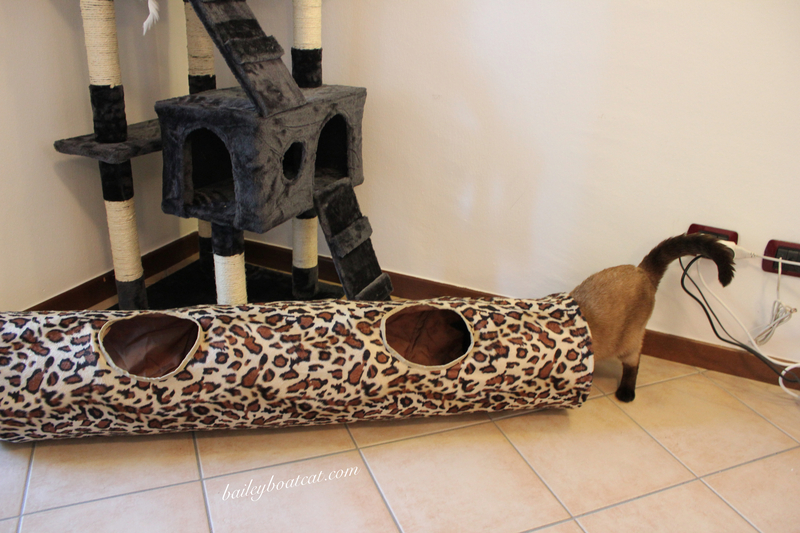 Quite an impressive cat condo and tunnel At least in the US we call it a cat condo.